So i’m finally getting around to writing my New Years post! I think i’m the last person to do one of these. I was a lazy blogger over Christmas and getting back into the habit of writing has been a bit of a struggle! This post will be a look back on what I got accomplished last year and this years goals and future plans! I know a lot of people dislike this sort of thing but I thought it would be fun to do. Last year around this time I was determined to make two mini collections showing my perspective on wearable fashion. I wanted to go to fashion school and was hoping to build a portfolio and confidence to get me there. A few weeks into the new year I realized that I found modern fashion horribly boring, and had very little interest in pursuing a career surrounding it. More research led me to have even more negative views on the industry and now I can’t even imagine taking that route. It’s very weird to think how much my mindset and dreams have changed since then. I wouldn’t say last year was exciting, but it was definitely eye opening and I’ve started down a path that I want to continue walking this year. 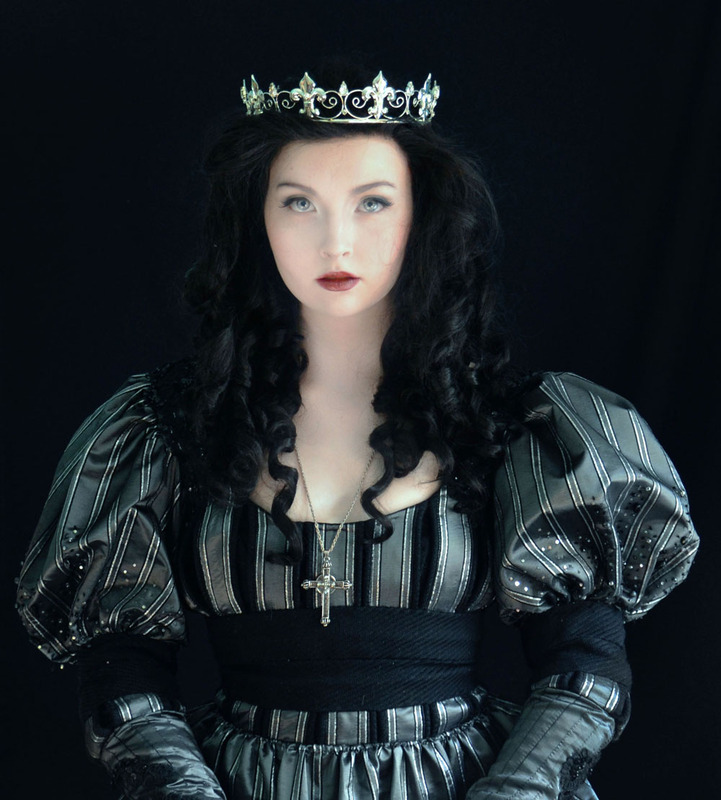 Now I’d like to work in theater or film, making or designing costumes. And I think internships will suit me better than college. That is something I hope to look into after I turn 18. Last year my mission was to get better at construction, and I did. But I didn’t make any pieces that I would consider showstoppers…things i’m proud of from every angle and put such a ridiculous amount of work into that I want to talk about them all the time. In 2013 I had several projects that literally fell apart due to shoddy construction, but I spent months making them look just the way I wanted, and I miss that. This year my tentative plans are to work on detailed projects and make garments i’m really proud of, both structurally and visually. I’ll have a list of the specifics near the end of this post. I’m not quite sure what 2015 will bring blogging wise, since I want my focus to be on bigger, more elaborate things, my projects will be more time consuming. If something takes two months to make I can’t exactly have twice weekly updates on it. I would like to do a few more basic pieces, foundation garments, and 48 hour challenges as well, but not enough to create enough content for eight posts a month. Because of this I may end up updating less often, have shorter posts, or come up with something new to post about. Such as dresses that inspire me, my research of the week, or something like that. It has been a crazy year for my blog – I got over 1.5 million blog views this year. I’ve been on buzzfeed three times and those articles combined have even more views than my blog received this year. I gained almost forty thousand tumblr followers, which is six times what I had at this point last year. My posts got almost 700,000 notes combined. I’ve also been on the tumblr radar, a trending blog, had trending posts, and been featured on the log in page! And thanks to that I was in a book. In the end it’s the kind words I get from people that mean the most to me. Views are exciting, and everytime I hit a milestone I smile quite a lot. But it’s the support in general and messages i’ve recieved about my work that have been the biggest motivator for me. I make costumes for selfish reasons, but knowing that other people enjoy them or gain a bit of inspiration from me sharing them is really exciting and makes me want to do more and do it better. So thank you very much if you’ve visited my blog this year, or left a comment, it really does mean a lot to me! Now, about costumes from last year! I made over twenty one pieces in 2014, which is crazy. 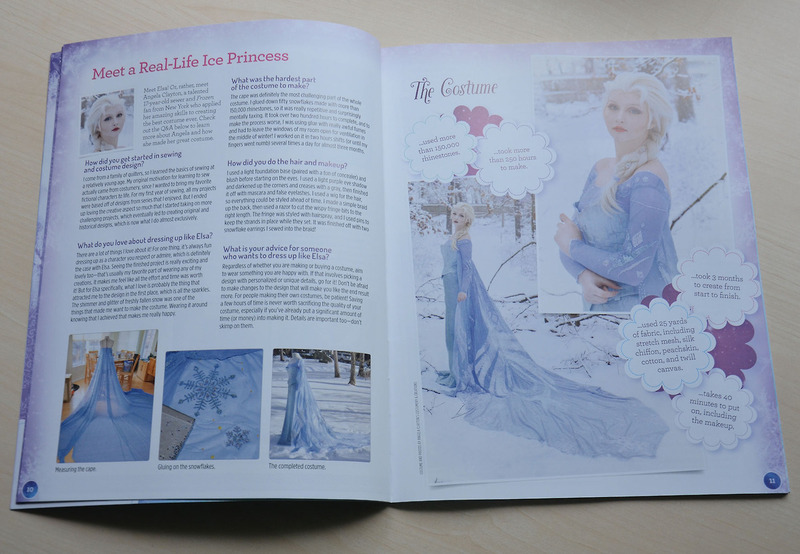 The first project I finished that year was Elsa! I’m actually not thrilled with how this costume turned out, but i’m proud of the work I put into it. It was definitely a test of patience. Doing something so time consuming and challenging was a big motivator for me, so I think it was a good way to start the year! I followed that off with two projects I strongly dislike, both are short black and grey numbers which didn’t turn out how I had envisioned. They were both poorly planned and rushed, which I think shows in the end result. I do like how they look from the waist up, though! Those projects were followed by a series of blue themed things. 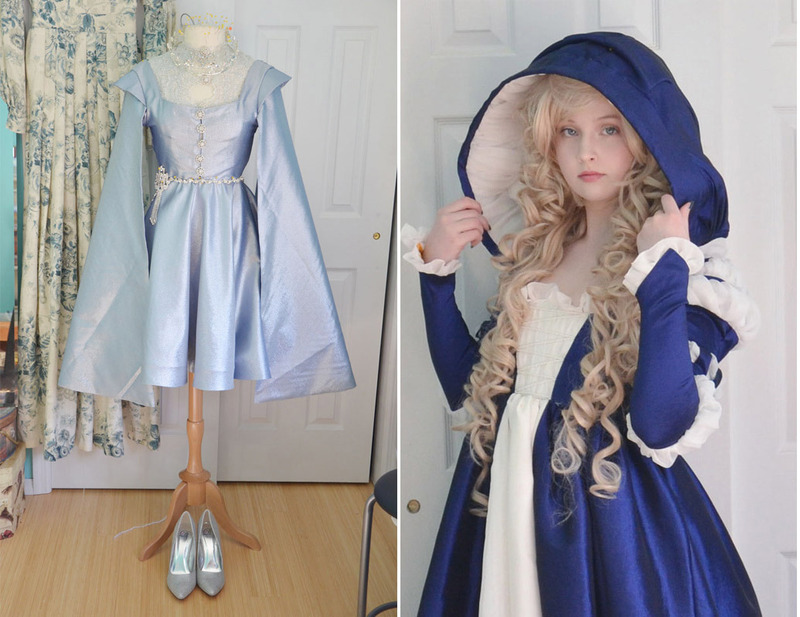 I fixed up a hooded Renaissance dress, and made a Joffrey inspired medieval suit of sorts. 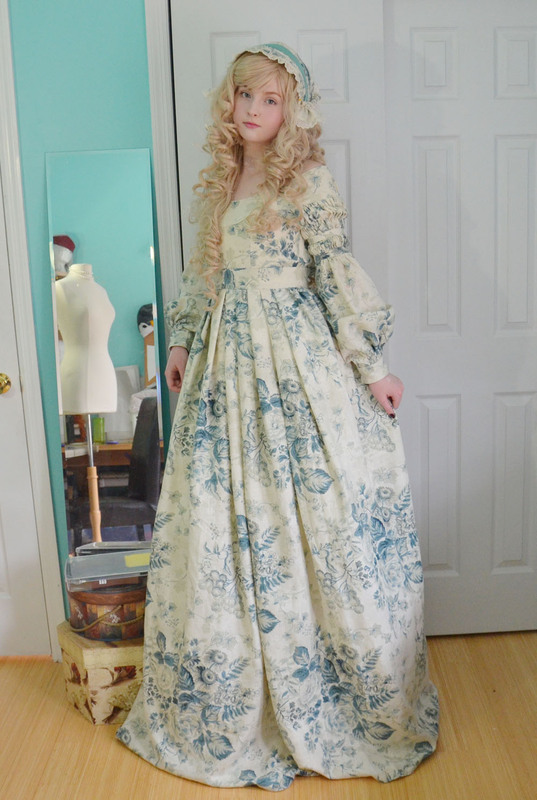 The Renaissance dress actually busted a seam because I used rayon thread by mistake – I like the dress and hopefully can get photos of it this year, but it is in need of some repairs! The Medieval suit was a big disaster, it ended up being too small at the shoulders, waist, and arms. The fabric wasn’t very forgiving and after spending twenty hours on it I tried it on and realized all the problems. It is past the point of being savable, and will probably get trashed soon! On the bright side, I made a floral dress that has a blue print and I adore it! I also made a bunch of red dresses. 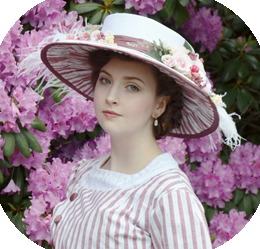 The 1830s ensemble with the bonnet is one of my favorite things I made this year, I love it so much, it makes me feel like a proper lady from some other time. I made another pleated dress from floral fabric later on in the year, I love the bodice of it to bits but the skirt isn’t full enough and it needs some alterations. Poor decisions were made on that one! In June I focused on three pieces which I called my “Dewdrop series” though I don’t think it really shows, I tried out and experimented with a lot of new techniques on these pieces. 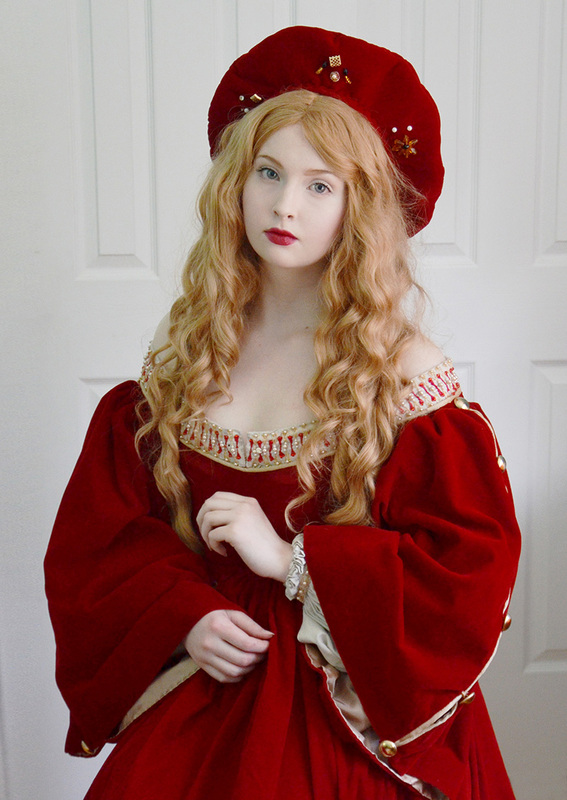 In July I made a Renaissance dress based off of a painting by Raphael and Gulio Romano. This was my first big attempt and embroidering and beading a pattern on anything. I struggled with fitting this dress, and the back of it is a bit of a mess. But I like how it turned out all together! In August I made my first flower dress which had a red and white theme. A month later I made another dress with the same technique, but used fall flowers. This is probably my favorite costume of the year, I love everything about how it turned out. In August I also made my Halloween themed project! Which was a similar dress filled with sparkles and spooky things. I also spent part of August on my Monarch series, which is on a hiatus right now. I ran into a lot of problems with these projects, and the only one that I’m happy with is this bodice. 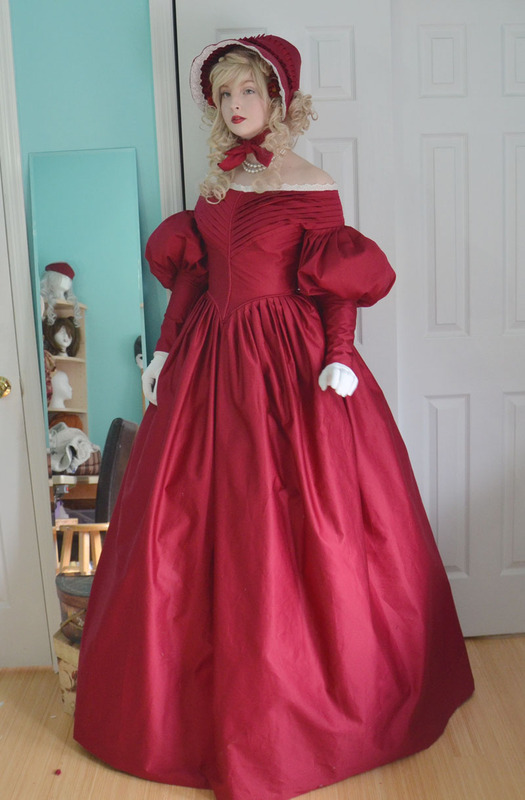 I did complete a ball gown for this series, as well. In October I focused on 18th century stuff, my attempt at a robe a la l’anglaise failed horribly, but my structured chemise came out well! Even though it is really inaccurate I like it a lot. November was supposed to be for 19th century fashion. 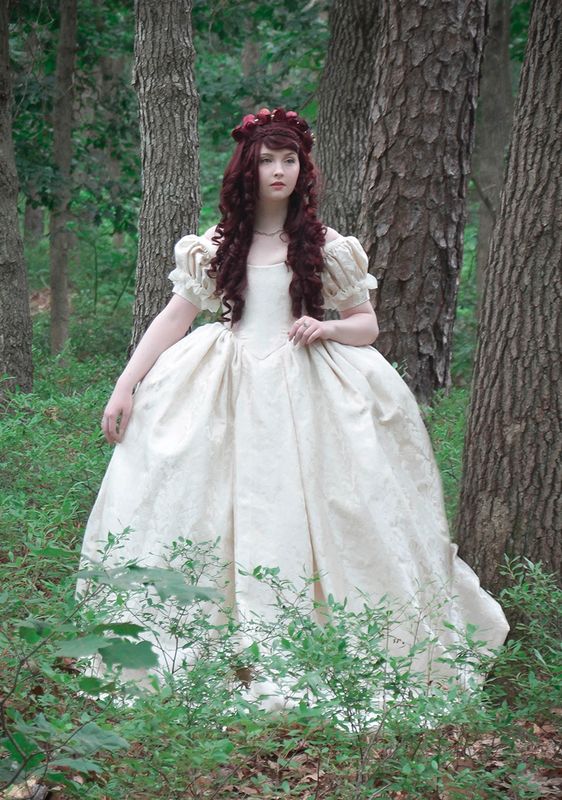 That didn’t really happen, but I did make a 1860s corset, and a doublet. 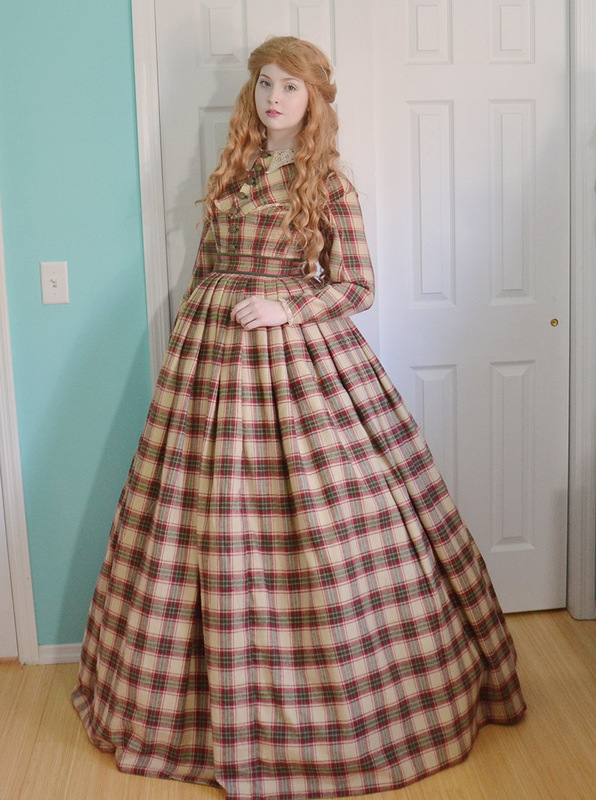 I also started on a Civil War Era gown, which didn’t get completely finished until December. 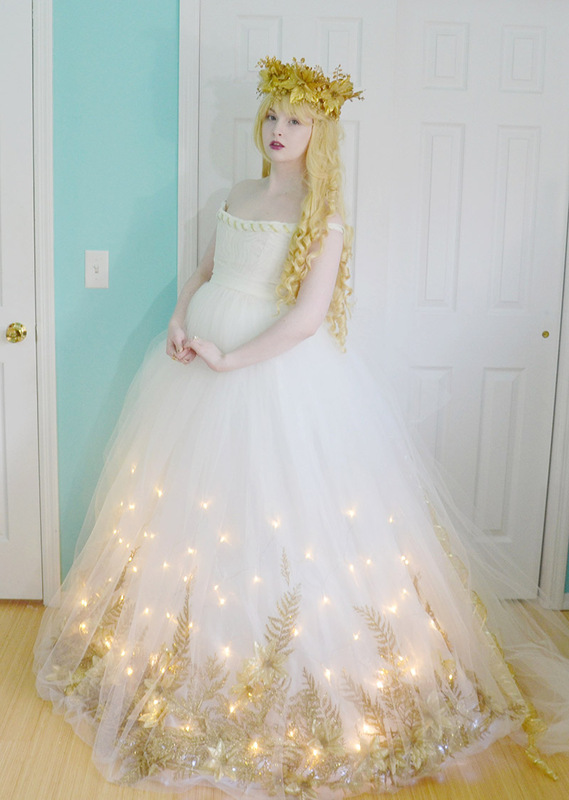 The final project for this year was my christmas angel costume. Visually this isn’t my favorite thing I made this year, but it came out exactly how I had planned which is an awesome, satisfying, thing. And a rarity when working with such…unique materials! I’m really happy with this dress and it was a good note to end the year on. I’m not completely sure. 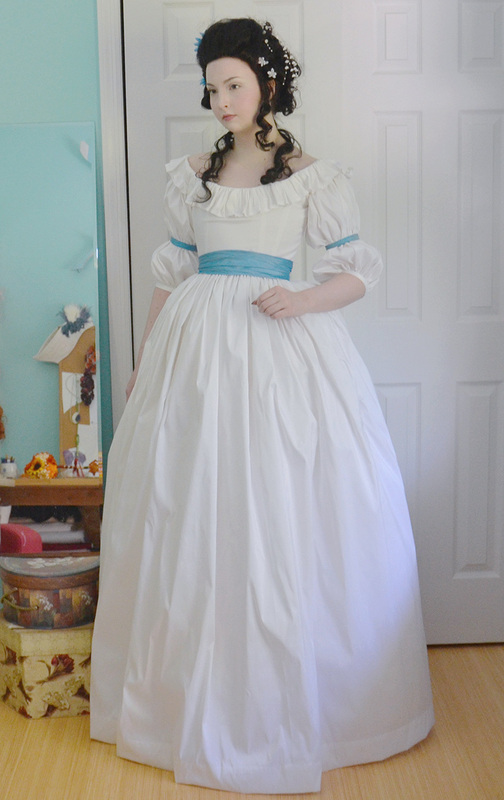 Last year my plans were to make something that required a huge hoop skirt, two small collections of cohesive garments, a Haruhi Fujioka cosplay, and an Elsa cosplay. I only accomplished one of those, and lost interest in the rest. So I don’t want to pretend my future projects are set in stone, because they could always change. But here are things I would like to make and have the fabric to do so!! And I will finish this massive post off with my goals. -I want to improve the fit of all my garments. I can wear almost everything I made last year, but a lot of those dresses suffer from being too small in the shoulders or wrists. Even though my mock ups fit, the final dress fabrics don’t have as much stretch or ease and ended up being too tight! I would like to make sure this doesn’t happen anymore, and also leave extra room in seams to let out garments if need be. -I want everything I make to be completely finished and wearable. I have a nasty habit of thinking garments are done when they look done. But usually after wearing a dress problems appear, such as them being too long in the hem, needing extra closures on the skirt, being a little too big or small. Also some garments get damaged, hooks fall off, seams need to be reinforced, zippers break, etc. 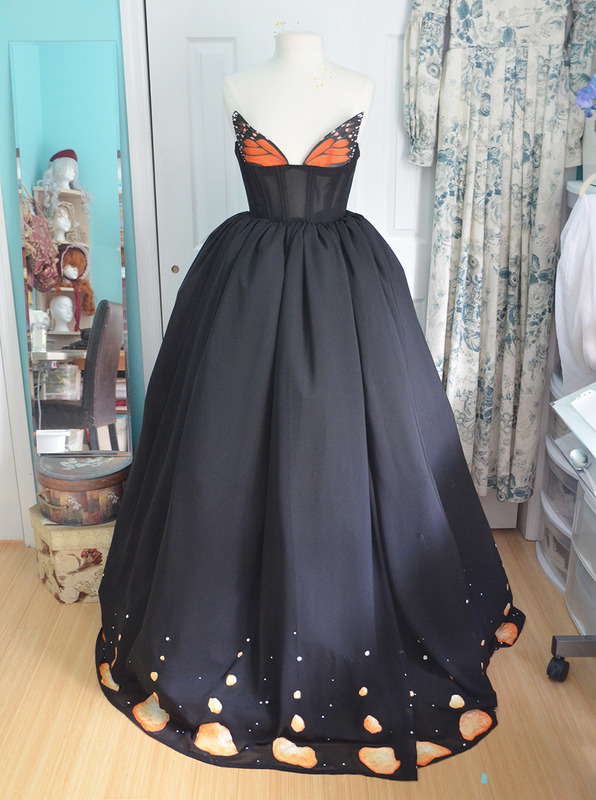 Once these problems appear my mind says “But that doesn’t matter – the dress is done!”. I don’t want that to happen anymore. I want to be able to take a dress from my closet and put it on without having to fix the zipper and hem first. This year I will be finishing everything and fixing garments that aren’t completely wearable. – I want to make things i’m proud of. I love a lot of what I made last year, but this year I would like to make things that have a lot more time put into them. I miss spending three months on a single project and hand stitching on forty yards of trim and eight hundred pearls, I love that sort of thing. I think that covers everything. Thank you so much for reading! I hope your year is off to a great start! Your blog is so inspirational!! I look forward to getting emails every time you post something. Excited to see what you make in 2015! Thank you!! I’m glad you enjoy it! Your talent is incredible! I am so happy to have come across you and look forward to see what you create this year! You are such an amazing young women and an inspiration. I just love your “Hmm let’s figure this out, anything is possible” mindset…it will take you anywhere you want to go on life…. Just keep being yourself..there is no greater way to bless this world! Thank you so much for the kind words! I really hope it will, and I shall do my best! I’m looking forward to seeing your creations in 2015! Isabel de Requesens is such a favorite of mine. Each of your costumes is an inspiration and makes me want to sew more and more. Thank you for showing us your amazing work. Thank you! Isabel is one of my favorites too – I think if it hadn’t been as frustrating to make I would like it a lot more. The end result is a bit tainted in my eyes because it was a pain at times, but visually I like it a lot! It has been so fun and inspiring to watch such a wonderful artist at work this year. You have inspired me to challenge myself both as a seamstress and as a painter, and I am so excited to see how you grow as an artist and designer in 2015! I hope you enjoy and take full advantage of this time you have to indulge in your passion. Good luck! That is fantastic! I hope you continue to grown in 2015 too, and I really appreciate the kind words!! Congradulations on being in a book! You’re a talented seamstress. You’ve had a really eventful year! I’ve been following your blog for about a year now and though I don’t comment much I do really enjoy your posts and what creative things you get up to. Thank you very much! I hope your year is filed with joy and wonderful things also. Are you in school right now? I was wondering because you said you were not 18 yet. Also, for me it would be very hard to fit sewing such intricate projects in with school and homework. I am very excited to see more of your outstandingly beautiful creations in 2015. I hop everything works out well for you in the coming year! Thank you for, that is very kind of you to say! I hope this year goes well for you too! I don’t have any school related commitments right now. I was homeschooled up until I turned 16, then I got my GED. I took a community college course in the fall of 2013 but that has been it so far! I can hardly wait to see your new creations for 2015. To me they taught me that when you do a mock up of a garment, do it with boning included. So that way you can be 100% and stay safe. I think my biggest issue is the cottons I use for mock ups do not have the same amount of ease as the heavier fabrics I use for the final dresses. I need to start making mock ups from heavier fabrics to avoid this. As a beginning costume maker myself, I really admire your work. I could definitely see you designing and making costumes for professional opera companies. And MY favorite part of your blog this year was when you found a spider inside your Christmas skirt. I almost died. Hilarious. Good luck this coming year! Excited to see what you do!!! That was definitely not my favorite part of my blog this year haha, but i’m glad you enjoyed it! Thank you, and same to you! Happy new year and good luck with your projects and goals in 2015! What is the title and author of the book you were in, please? 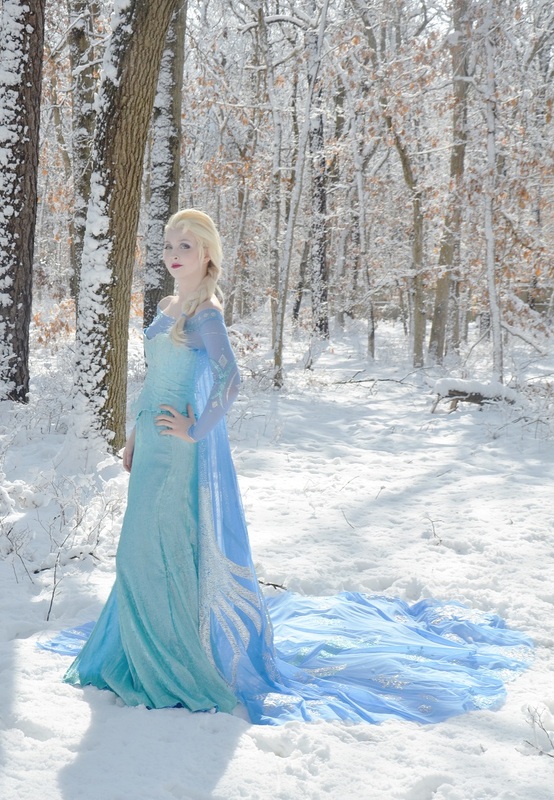 It is called “Ice Princess Crafts” by Colleen Dorsey! Haha – I once said on tumblr that I wished I could hem velvet for a living. That would be a great job. It’s weird, I hated hand sewing for a long time but now I enjoy it. I go a bit mad when the thread isn’t cooperating and my fingers get sore, but overall there is something peaceful and satisfying about it that I love! I definitely understand that it isn’t for everyone, though. Thank you very much! I appreciate that – and the same to you, I hope you have a lovely year and that your projects go well, especially the handsewing! I’ve enjoyed following your constructions of all these beautiful outfits. I can’t wait to see what you come up with this year! And, congratulations on being featured in a book! You’re the reason that I bought my 8-year-old a sewing machine for Christmas this year! I’m hopeless when it comes to crafty things, so on Saturday, we’re going to a local sewing shop where they’ll show her how to work her own machine. You get so much joy out of your projects…I hope that sewing will give my little one the same experience. Or at least she’ll be able to hem my pant cuffs! Thank you so much! You are very kind! 🙂 Haha I’ve been reading a few blogs for YEARS and still haven’t commented on them. Comments are of course appreciated but just the fact that you read and enjoy is plenty enough for me!! I hope you get time to sew soon!